Epic News Element module provides total control of your content, include & exclude by Categories, Tags, Author, etc. Skip posts by using offset and prevent duplicate post by using unique group. With Epic News Element you have a freedom to design your own news, blog or magazine website layouts with frondend editor. Each module have pagination feature. From normal pagination, next/prev, load more, and auto load on scroll. This plugin is translation ready. We provided translation files: ”.po” and ”.mo” for you for easy translation with translation tools. Change color of the header on the module, change pagination type, number of post showing, overlay color of hero and any other option you can customize. 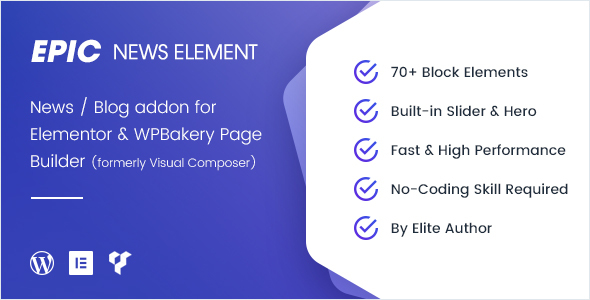 You can use News Element Pro with your favorite themes that work with Elementor & WPBakery Page Builder for WordPress plugin. Each element on Epic News Elements is responsive and ready for Retina Display or HiDPI (High Dots Per Inch).